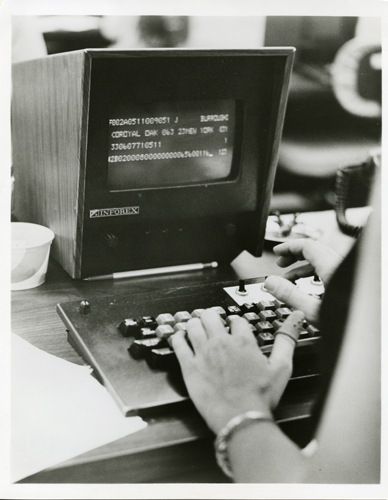 This is a black and white image of a woman typing into an IKE 1301 system. Only her hands are visible. There is text on the small Inforex display screen. Light is coming from overhead. Included with the picture is a small summary description sheet. It says "Each keystation of the Inforex key-to-disc data preparation system has a CRT display for sight as well as key verification of full records, and is capable of use either for data preparation or verification. The eight-station system replaced six keypunch machines and four verifiers at United Van Lines for greater operating flexibility, cost savings, and increased throughput.". Written on verso side in pencil at the top edge is "#1461".